ZIMBABWE – ONE of the most anxious moments in the life of a speechwriter/advisor is when the principal is delivering the speech that you authored. No matter how many times you would have gone through the speech, again and again, with the team and/or the principal, with different pairs of eyes, there is nearly always something that defies notice. You are never sure it will go according to the script. A word could be mispronounced and throw everything into chaos. Loose pages could get mixed up during the speech. The principal might inadvertently skip a page. So you sit there in the crowd, willing him or her to do well, to follow the script. You want it to end as soon as possible. As everybody else laughs at a joke, or smiles approvingly, you sit there anxiously, hoping that the principal is not thrown off-course by the excitement of the moment. You say a quiet prayer and hope it ends well, without any embarrassing mishap. Over time you learn your principal’s strengths and weaknesses “ things that he likes and things that complicate life for him or her on stage. You grow a list of words to avoid, words and clichs that are likely to cause the tongue to twist and stumble. The moment of great jitters, though, comes during the course of a speech, when after coasting through flawlessly, sticking faithfully to every word of the script, the principal unexpectedly decides unilaterally, that this is the moment to steer off-script, and say a few words off-the-cuff. At this moment, your heart is literally in your mouth. It skips a beat or two, for it is at moments like this that it could all go horribly wrong. You know the media is not interested in carefully written scripts. They are too nice and often there is little controversy, no punch-lines. The preferred diet of news-gatherers consists of loose off-the-cuff statements. They are spontaneous but also more honest. It is those few words that will often form the catchy headlines of their stories. So, for any speechwriter, the unplanned off-the-cuff moment, over which you have no control, is the most risky moment, indeed, the most dangerous because it could dilute the entire delivery. You try to rehearse potential off-the cuff moments beforehand, but principals have a mind of their own and once they are on the podium, you have no control whatsoever. I know these anxious moments too well, because I was once in a position of advisor and in the course of my duties, led the team that was responsible for speech-writing. It is a highly rewarding experience, to write speeches for important people; but also one of great responsibility. You always try your best, as a team, to present your principal well. Your words are not your words but his or her words and if you fail, you fail him or her, too. But once the principal is delivering his speech, they have not yet invented the remote control for that. Thankfully, I had a principal who was willing to use his ears and, in my time, we were spared such embarrassing moments. As a member of the speechwriters/advisors union, I have some sympathy for President Mugabe’s speechwriters/advisors after Tuesday’s embarrassing incident in the Zimbabwean Parliament. Apparently, President Mugabe gave the wrong speech altogether. He was given an old speech that he had delivered at a previous event “ the State of the Nation Address, which was heavily criticised at the time. The media picked up the error when they noticed that the written speech they had been given was completely different from the speech that President Mugabe was delivering. It is a grave error. I imagine the speechwriter/advisors must have noticed the error, too but, by then, the President would have been in full flow, delivering his speech at the opening of Parliament. What do you do? Do you rise and whisper into the President’s ear that he is actually reading the wrong speech? Or do you sit back and suffer the torture and embarrassment of the situation, an embarrassment of the type that causes you to wish for the earth to open itself and swallow you? It is not a situation that I would wish upon anyone. This might well be an honest but negligent mistake. The President’s spokesperson, George Charamba has called it a mix-up. It probably is. But given the political climate that is fraught with suspicions as the race to succeed President Mugabe intensifies, there will be a flurry of conspiracy theories. Fingers will be pointed at some people. Which faction do they belong to, they will ask? Are they not Gamatox “ short-hand for those who are allegedly aligned to former VP Mujuru, ousted last year and now challenging President Mugabe? It will be said that this was a deliberate move to embarrass President Mugabe, to undress him before the nation’s eyes and ultimately before the world, such is the attention that the man attracts across the world. It will be said that this was an intentional ploy to paint a negative picture that President Mugabe is now too old; that his wits have escaped him. If, as it seems, it was a genuine error, this will be sad, but it’s almost inevitable that someone will be made to pay the price for it. This is politics after all “ someone must take responsibility. Having said that, critics will almost certainly pounce on the incident to advance their argument that President Mugabe’s advanced age makes him unsuitable to continue in office. They will say these are the signs of advanced age, and not just an ordinary mistake. In this, they will probably refer to a slightly younger version of the man who, only a few years ago, faced with the very same situation, corrected the wrong speech that he had been given by his lieutenants. On that occasion, as he started reading the speech, he discovered it was not the one that he had corrected, and abruptly stopped his presentation, turning sharply towards his advisors and impatiently announcing, microphone on, that this was not the speech that he had prepared. They scurried to find the right speech. He waited. Then he continued when they found it. It’s not long ago when this incident happened, but critics will say that was a Mugabe who had the sharp mind to identify the difference between the speeches. They will wonder how he failed this time to notice that he was reading not only the wrong speech for the occasion but a speech that he had read before, just a few weeks ago. That he went through the whole speech without noticing the error or correcting it will be used by critics to bolster their case that age has caught up with him. How had his sharp faculties failed him on this occasion?, critics will be asking, arguing that the mind is now more encumbered by age. But his supporters will argue that there is nothing special about the error, that other leaders, including President Obama have made similar mistakes before. These defences do not help the cause. In the Obama incident, the leaders had noticed the error and in any event they weren’t spared criticism. That it has happened elsewhere doesn’t make it any better. But if President Mugabe failed to notice his error as he read the speech, what about the MPs who were nodding and clapping approvingly as he spoke? Did they not notice that he was reading a script that he had read before? That is a sad reflection of the mediocrity of the majority party in Parliament. It is like a large group of people who, responding to the pull of sycophancy, will cheer everything that the leader says, without the critical ear. 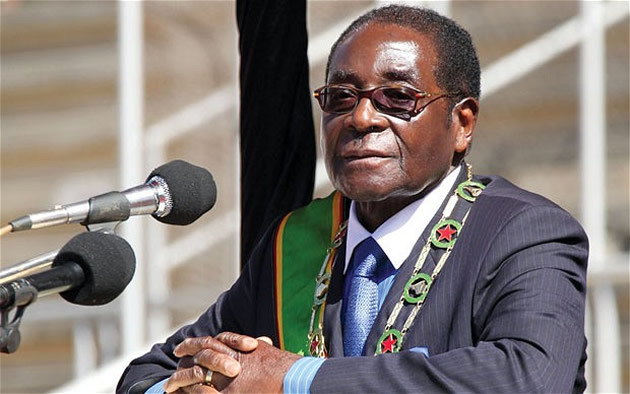 President Mugabe is 91. Most of the parliamentarians are young people. If they did notice the error, why were they responding positively to a repetition? The levels of mediocrity are astounding. Having been a member of an advisory/speech-writing team, I do have some sympathy for the men and women around the President whose crime might be an honest mistake. But it has exposed their boss to ridicule and embarrassment and someone will have to pay the price. As for the President himself, critics will not let this moment go. They will ask, inevitably, whether this is yet another signal of advanced age. In this regard, I recall a story told by a Malawian colleague, re-counting the last days of Malawi’s founding leader, Dr Hastings Kamuzu Banda. Apparently, speaking at a rally just before the historic first elections in 1994, Banda had implored his supporters to go to the polling stations in their numbers to vote for him next year, when in fact the elections were only a week away. This was probably a slip of the tongue, but the hilarious part is that when the Malawi Broadcasting Corporation aired the speech, the producers had had to edit the tape and use a voice-over to erase the â€œnext year so that it would sound as if he had actually said next week! It was very awkward but all this, apparently, to save the old President some embarrassment. I have no idea whether this account is a true reflection of what happened, but for what it’s worth, it serves to demonstrate some of the lengths to which authorities will go to cover up such mishaps. President Banda’s mistake was easier to cover-up, even with awkward results. The latest one in Harare, on the other hand, is a lot harder to sweep under the proverbial carpet, especially because critics will point to prior incidents, and argue that there is a worrying pattern that is developing. Back in December 2014, he had to be corrected by army generals that he was addressing when he stated, inadvertently, that Morgan Tsvangirai, the MDC leader, had won the March 2008 elections by 73%. That slip was pounced upon by critics who argued that it was a revelation of what had actually happened in 2008, although results had later been manipulated to enable a presidential run-off election. His unfortunate fall earlier this year, on the airport’s red carpet, which the then Government spin-doctor, Prof Jonathan Moyo famously described as â€œbreaking the fall, was also used by critics to argue that the President was struggling with old age. And during his birthday interview on ZBC in February 2014, he had also spoken about the 1980 elections, when he had been asked about the August 2013 elections, and seemed totally oblivious of his mistake. Critics will look, not just at this incident, but at the bigger picture and wonder whether he is fully capable of continuing in his role, let alone stand again as a presidential candidate in the 2018 elections, when he will be 94 years old. Zanu PF has already nominated him as their candidate. Time, always the magician, will tell. What is certain is, when the history of his rule is written, it is these embarrassing incidents that will be highlighted. The more they increase, and with advanced age, this is more likely than not, they will multiply, piling further embarrassment on a man who, by now, should be retired and enjoying his sunset years in the comfort of his home “ having done much that could possibly be done by any man in a lifetime.